NOTE: The Wizarding World of Harry Potter at Universal Orlando is divided into two lands at two parks. This article is about the Hogsmeade land, home of Hogwarts Castle, at Islands of Adventure. The other land, which is located at Universal Studios Florida, is The Wizarding World of Harry Potter - Diagon Alley. The two parks and two lands are connected by the Hogwarts Express train. Speaking of the train, check out our editorial, Why the Hogwarts Express may change everything at Florida's theme parks. Also, we have got the lowdown on what might be coming next to the Wizarding World of Harry Potter. Theme parks and park designers are fond of using some variation of the word "immersion" when describing their lands and attractions. Sometimes, it's warranted; often, the barely-there themeing makes their use of the word questionable at best and blatantly false at worst. The folks from Universal parks and Warner Bros. films, however, clearly aspired to grand-scale immersion when they developed The Wizarding World of Harry Potter. It is one of the most richly detailed, immersive environments ever presented at a theme park. By taking the art of storytelling to new and breathtaking levels, it reset the bar for park design when it debuted in 2010. Inside Hogsmeade's gates, nearly everything and everybody stay true to the Harry Potter mythology. There is no sunscreen for sale in any of the shops. Why would anyone in the snow-dappled village need SPF 30? (Pay no heed to the actual blazing Florida sun that shines above this fictional land.) Items that are for sale, including quidditch quaffles and exploding bonbons, are all actualizations of the fanciful things conjured by Potter author, J.K. Rowling. Both casual and ardent fans of her wildly popular books and the films they inspired will revel when they visit the park, and Rowling's world comes to life around them. How immersive and painstakingly detailed is Universal's paean to Potter? Sure, whimsical discoveries abound, such as musical instruments that play themselves and a growling, fang-baring Monster Book of Monsters. But consider some of The Wizarding World's more mundane details. For example, many of the storefronts in Hogsmeade, over a thousand years old according to Rowling's lore, have settled through the millennium. There isn't a straight line to be found. The glass in the shops' windows have imperfections and sag in their weather-beaten frames. There is a patina of rust as well as copper and brass stains, all manufactured by park designers ,throughout the land. That is an astonishing commitment to the story. Hogwarts Castle, which dramatically announces itself when guests reach the end of the village and suddenly see it towering high on a hill, is everything a muggle who's been invited to the off-limits shrine could hope for. Meandering through the hallowed halls on their way to the Fobidden Journey ride, guests encounter all sorts of wizardry, including portraits that, astonishingly, start talking and moving and snow that begins falling from the ceiling. Even without the ride, the tour through Hogwarts would be an incredible standalone attraction. But oh, the ride! Using a breakthrough robotics ride system, filmed sequences projected onto mini domed Ominmax screens, and lavishly appointed scenic design elements, the Fobidden Journey is pure magic. It's a technical tour-de-force that sends riders flying along with Harry and his wizarding friends for a one-of-a kind adventure. Close encounters with a fire-breathing dragon and a thrashing Whomping Willow redefine immersion for this wholly immersive attraction. It is, by our accounts, one of the best theme park attractions in the world. Wizarding World's impressive immersion, however, sometimes comes at the expense of theme park practicality. Hogwarts Castle and the Forbidden journey ride have been designed to handle enormous crowds. But the shops are all built to scale—to serve the story, no doubt—-and the tight quarters can't comfortably accommodate the hordes of muggles who visit on busy days. Another quibble: The coaster, Flight of the Hippogriff, seems a bit out of place in the otherwise meticulously themed land. It is a repurposed holdovers from Wizarding World's previous incarnation as Islands of Adventure's Lost Continent. A second holdover, the Dragon Challenge coaster (which was known as Dueling Dragons when it was one of the featured rides in the Lost Continent) was even more incongruous when it was open in Hogsmeade. Universal closed the ride and bulldozed it in 2018. In 2019, it will open a new heavily themed coaster that will have been designed from the ground up for the Potterverse. 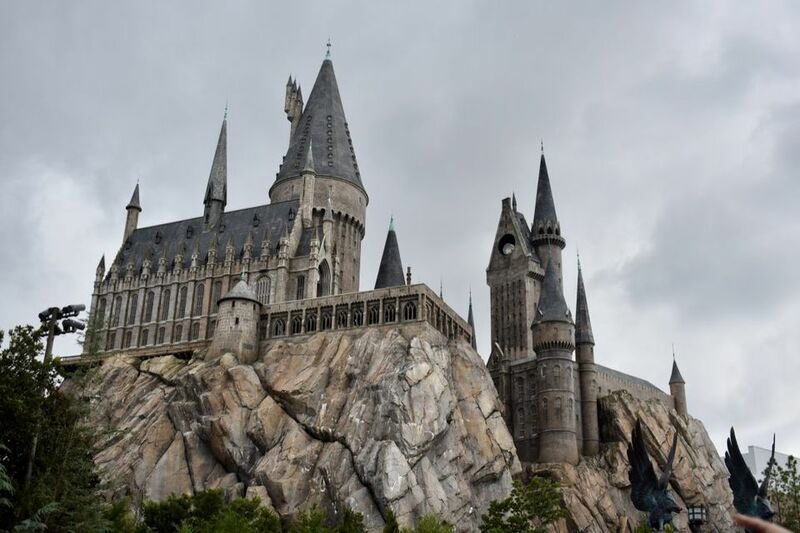 We also suspect that the remains of the park's truncated Lost Continent is destined to be lost forever, since Universal is likely to have more Potter plans up its robed sleeve. Should that happen, muggles will no doubt clamor to be immersed in more of The Wizarding World. Entrance to The Wizarding World of Harry Potter is included in the general admission to Islands of Adventure. Note that a two-park ticket is required in order to ride the Hogwarts Express. Are you thinking of visiting Harry and the gang? Want to avoid lots of muggles at the parks? Learn how to beat the crowds, save money, and have a better, more value-filled visit in my guide to the best time of year to visit Universal Orlando. Tips: Guests at Universal Orlando's hotels can enter IOA one hour before the general public. Also, Guests with line-skipping Universal Express passes used to not be able to use it for Harry Potter and the Forbidden Journey. That is no longer the case. Note that the vehicles may not accommodate heavier guests with certain body types. Test seats are available prior to boarding. The physical thrills are relatively mild, but the psychological "gotcha" thrills are intense. The signature Hogsmeade attraction uses advanced robotics to send guests on a wild journey alongside Harry, Hermione, and Ron where they experience many iconic scenes from the films. It is the most advanced, stunning park ride anywhere. See our review of Forbidden Journey. The family coaster climbs a mere 43 feet and reaches a top speed of 29 mph, making it fairly accessible to all but the most thrill-averse guests. Loosely themed to the Potter mythology, guests pass Hagrid's Hut and encounter a Hippogriff while aboard the coaster. What's to Eat and Drink? The Three Broomsticks tavern offers Potter-specific fare such as Cornish Pasties (pastry puffs filled with minced beef and vegetables) and strawberry and peanut butter ice cream. Conventional grub, such as fish and chips, is also available. The food is quite good. The Hog's Head bar as well as outdoor carts feature butterbeer (frozen and non-frozen), which has traces of shortbread and butterscotch and is addictive, pumpkin juice, and "real" alcoholic beverages. Discover other places to eat at the resort in our feature, best Universal Orlando dining. Ollivanders wand shop features a charming, brief show in which "the wand chooses the wizard" (a lucky chosen youngster). The shop accommodates only about 25 guests at a time, and the line to get in can grow long. Wands are for sale in an adjacent store. Other stores include Zonko's (a joke shop made famous by the Weasley twins) with Potter oddities like Extendable Ears; Dervish and Banges, which offers a lot of Quidditch gear; Honeydukes, a sweets shop with gastronomical curiosities such as Bertie Bott’s Every-Flavour Beans (including--ew!--fish and cheese flavors).